A very popular type of website is the ‘food blog’. Cooking and baking are hot, and the number of food blogs seems to rise. In this post, we’ll go over the things that will give your food blog just that little extra. Both for your users and in terms of SEO. This might be the most important piece of advice I can give you: focus on long tail. The number of food blogs grows every day. I recently talked to an old friend of mine that just started a blog about nutrition and healthy food. 5 years ago I reviewed a blog that had a weekly bread recipe and 200,000 visitors every month. The main problem with the number of food blogs, is that you really need focus to rank. You need to find your special niche and write great content about that niche to surface on page one in Google. This is really hard. The better and more unique the niche, the easier it will be to rank. I think focusing on long tail will give you a head start. Do you know the Yoast Google Suggest Expander? You can use that tool to find all the things Google suggests when a user types a query in Google. With that tool, you might find the niche or long tail keyword you’d like to optimize for. I searched for paleo and it gave me keywords like ‘paleo almond butter cookies’. It’s quite an extreme example, but if you check that keyphrase for suggestions, you’ll find over 30 more topics/recipes to write about. These can all be considered long tail keywords. Think about this: thousands of people per day visit food websites. Thousands of people have no clue about what to eat tonight. About what to make as a healthy children’s snack. About what kind of cake would suit their occasion. 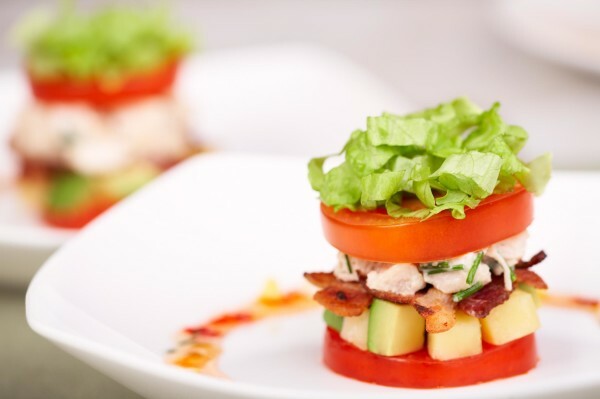 Food is the very bottom, most essential layer of Maslow’s pyramid. Food is emotion. That emotion needs to be reflected by your choice of theme. If you’re baking cupcakes, please use a more playful design than when you’re posting BBQ recipes. Food is personal. Make sure your website has a clear picture of yourself and a description of what your personal passion for food is. What kind of food makes you happy? Make sure this is very clear from the start to bind a certain audience to your website. Add a nice tag line to your header stating just that: what kind of food is your website about. I’m not saying that a food blog is about recipes per se, but most of the food blogs I have read at least contain recipes. We have talked about schema.org before. It’s a way to markup your content so search engines recognize very quickly what your page is about. 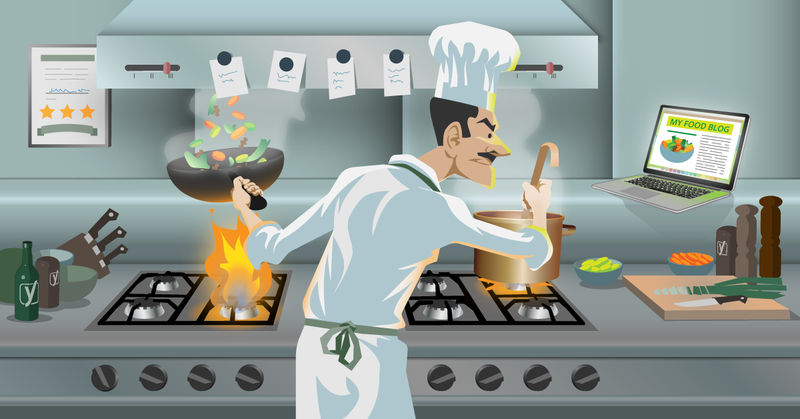 Google, Bing and Yandex have created a Recipe schema especially for websites like yours. NutritionInformation: really in-depth information on how healthy your recipe is. I understand that you sometimes just don’t know when it’s a recipe of your own. Some information might help your health-driven audience though. Image: as mentioned earlier, a great image really helps your post. 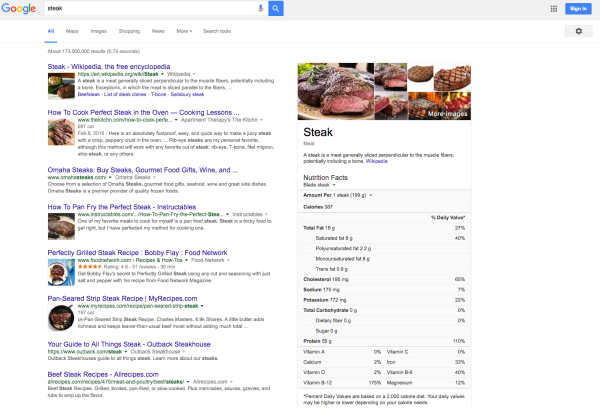 Not just in that it triggers your visitor, but it also works in Google Images and for instance Pinterest. More on social later. That entire right side will give you more information about fat and vitamins. Just a tip! You’d be surprised how many people start planning Christmas early. I, for one, would appreciate all of these dishes in September as well. See if you can find seasonal dishes without linking it directly to holidays as well. Categories like ‘for a winter’s evening’ or ‘a rainy day’ might be more suitable for your audience. Last year Jamie Oliver released a book about comfort food. I like that on a stormy day in May as well. I can imagine the number of searches for that go up in September/October though. Google Trends agrees. In Google Trends, you can clearly see that during the summer months, that keyword will give you less traffic. People like BBQs and ice cream during these times. Bottom line: let Google know you have these post in time. And feel free to repost a Christmas post/recipe around Christmas, by the way. Just make sure you check the content of the post, update if necessary and keep the same link. If you don’t have the link in your URL, simply change the publish date and you’re good to go. It might give that ‘old’ post new visitors. One out of ten posts on my Facebook timeline is about food or beverages. About cooking or restaurants. On Instagram, people use tags like #yummy, #foodporn, #instafood, #foodpic and multiple variations of #(om)nomnom a lot (don’t you just hate that omnomnom trend? I do). Searching Pinterest for ‘salad‘ will keep you scrolling recipes for hours. If you know me, you’ll understand I obviously searched for ‘burger‘ and just changed the link. Same story. If you have a food blog, you need to leverage social media. Find out what social media platform your preferred audience is using and start engaging. Pinterest and Instagram seem to work really, really well. But why not leverage sites like allrecipes.com as well? We’ve written about branding before, and sites like that might help you get your name out. Let’s not forget Youtube. Almost 600,000 subscribers for BarbecueWeb and a whopping 2,500,000+ subscribers for MyCupcakeaddiction! This can only motivate you to start recording videos. Set up your channel, promote it via your website and other social media and see if it works for you. Please note that numbers like that require hard work and a lot of effort. Give it your best shot. I hope this article will give you some pointers for your own food blog. Feel free to share your own food blog success stories via social media or the comment section below. I’m looking forward to these!